I’ll never forget the first time my “perfect eater” turned his nose up at a vegetable. Piper had just turned three years-old, and had just recently discovered the power of the word, “No.” He couldn’t really say much else at the time (remember his apraxia story? ), but he certainly knew how to use the N word. One of his favorite vegetables had been sweet potatoes, whether they were cubed in a hash or mashed. But on this particular evening, Piper, for some reason which I’ll never understand, decided that mashed sweet potatoes were no longer a food he enjoyed. Out of his little mouth came the N word, “No,” and the passing of his plate. I remember standing in disbelief that Piper no longer wanted to partake in what had been his favorite food. What? Why? In the three years since that evening, I’ve witnessed a lot of “no thank you” meals. All of these “no thank you” food moments have taught me a valuable lesson as a parent and real foodie: Don’t take no for an answer! Here’s the thing about food. With processed food, the strawberry pop-tart (which we know isn’t actually made with fresh berries, right?!) will always taste the same, because it’s chemically enhanced and altered in a lab to always taste the exact same way. When it come to real food, there are many different textures and flavors to experience. One little sweet potato can take on multiple different textures and flavors. When a sweet potato is cut in half and roasted with olive oil, it caramelizes and softens. When a sweet potato is sautéed with sausage in a hash, the cubes take on a savory flavor and crispy texture. When a sweet potato is juiced, it blends with the other vegetables and fruits to create a pleasantly sweet juice (really, try it!). And when the sweet potato is cut into strips, drizzled with olive oil and salt, and roasted at a high temperature, that humble sweet potato transforms into the most amazing fries. When it comes to real food, don’t take no for an answer! We all develop different taste and texture preferences, and that’s 100% okay. The beauty of real food is that just because you, or your family, may not care for mashed sweet potatoes, doesn’t mean sweet potatoes can’t make the grocery list. Try roasting a sweet potato to make fries, or adding cubed sweet potatoes to a soup. Don’t give up on a food just because it may not be well received in a particular form. Try experimenting with different spices and preparation methods. Yes, Piper still doesn’t care for mashed sweet potatoes, but he loves sweet potato fries, and he’ll gladly partake in lentil soup with sweet potatoes. Today’s recipe is a prime example of how real food may be presented and enjoyed in a different form. 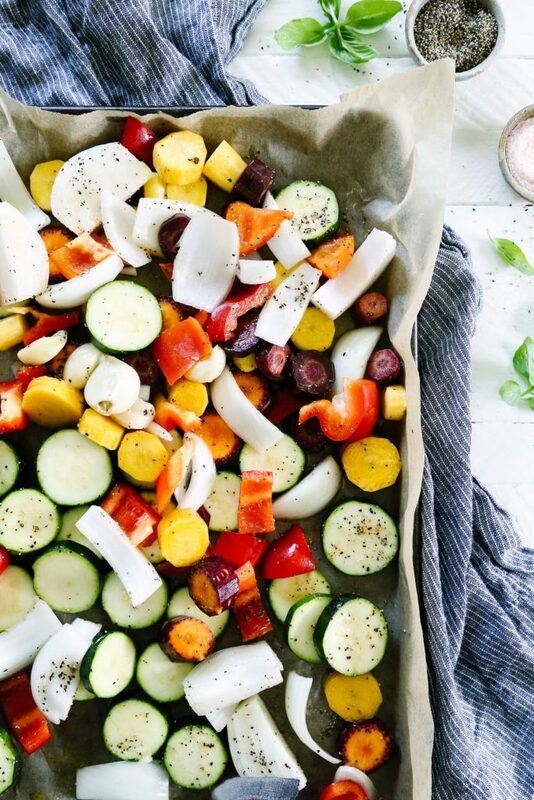 This recipe is packed full of veggies that many kids may not naturally want to eat: mushrooms, peppers, zucchini, and carrots (although most kids love carrots in any form). 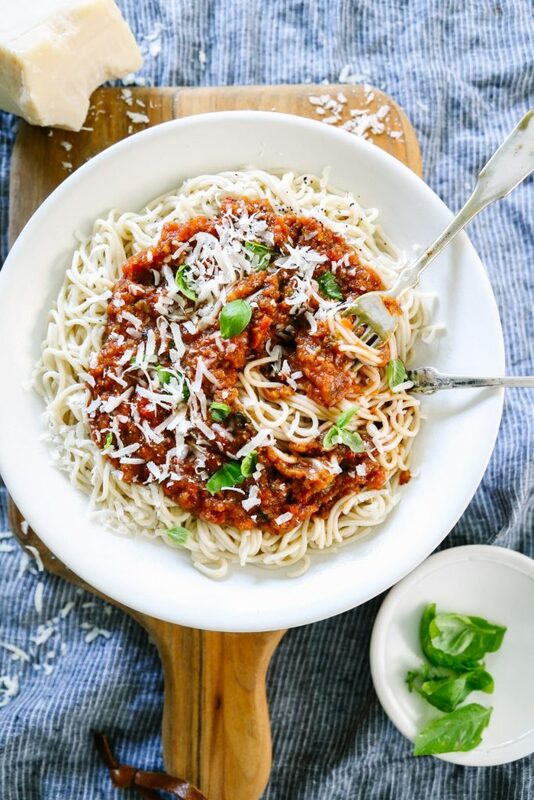 The veggies are first roasted with a bit of salt and pepper to bring out their sweet flavor, and then pureed with tomatoes and spices to create a veggie-packed spaghetti sauce. And what kid doesn’t love spaghetti sauce?! I’m not a big fan of hiding vegetables in kids’ food. I truly believe that in order for kids to become good eaters in a processed food world, they need to know what they’re eating. But, with that said, if your kiddos have expressed a dislike for mushrooms, or maybe zucchini, in the past, I’d go ahead and make this sauce without telling them what’s inside. Sometimes kids (and adults) need to get over the mental roadblock of thinking they don’t like something before knowing what they’re actually eating and enjoying. After trying the sauce and loving it, invite them to cut the veggies and make the sauce with you in the future. Behold the power of the “don’t take no for an answer” parenting lesson. 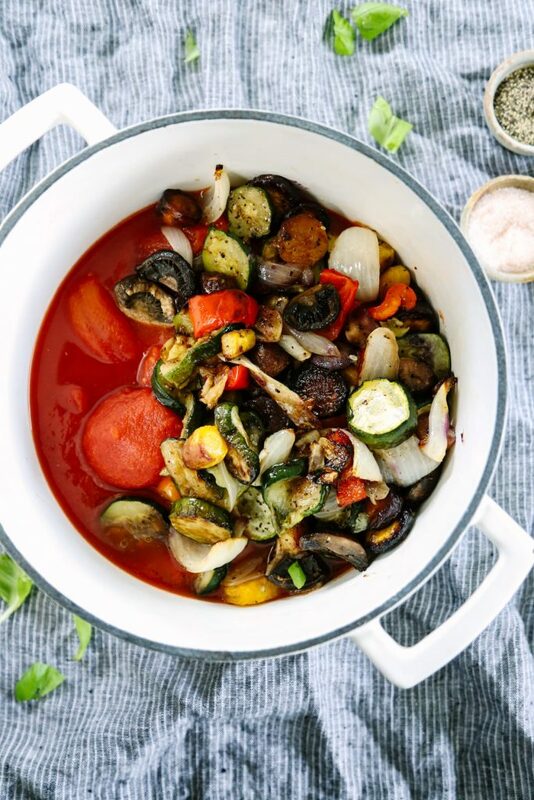 This recipe is packed full of veggies that many kids may not naturally want to eat: mushrooms, peppers, zucchini, and carrots (although most kids love carrots in any form). 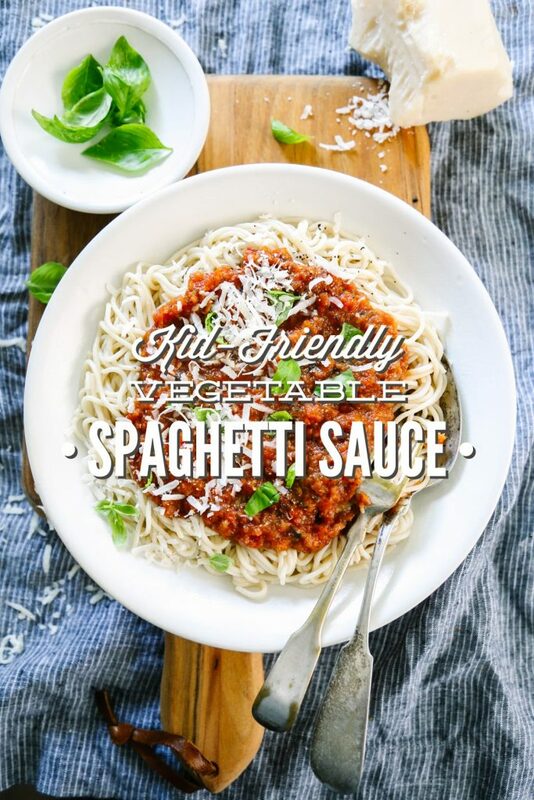 The veggies are first roasted with a bit of salt and pepper to bring out their sweet flavor, and then pureed with tomatoes and spices to create a veggie-packed spaghetti sauce. And what kid doesn’t love spaghetti sauce?! Cut into uniform size the carrots, zucchini, pepper, and onion. Add the vegetables to a large, rimmed baking sheet. I like to line my baking sheet with parchment paper for easy clean-up. Add the whole garlic cloves to the pan. Drizzle olive oil over the vegetables. Sprinkle ½ teaspoon of salt and ½ teaspoon of black pepper evenly over the veggies. Mix the vegetables with your hands to coat evenly with olive oil, salt, and pepper. Remove the pan from the oven, and add the mushrooms. Stir the mushrooms with the roasted vegetables. Roast the vegetables for an additional 20-25 minutes, until the mushrooms are soft. Add the vegetables to a large Dutch oven along with the can of tomatoes (and juice). Use an immersion blender to blend the veggies and tomatoes together. Add the tomato paste, vegetable broth, fresh basil, oregano, and ½ teaspoon of salt to the pureed veggies and tomatoes. Simmer the sauce for 20 minutes, stirring occasionally. Before serving, stir in the parmesan cheese. 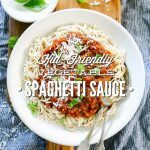 Serve the sauce over spaghetti noodles or zucchini noodles. 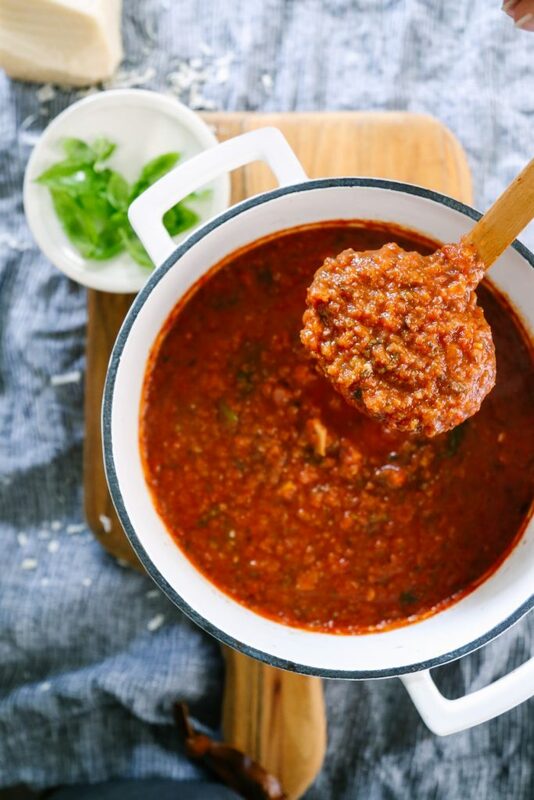 This recipe makes a ton of sauce (enough to fill a 3 quart Dutch oven). 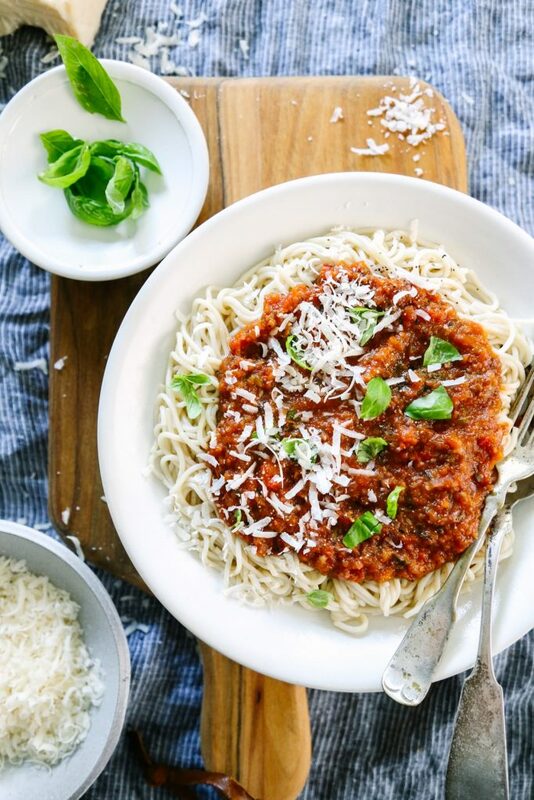 This a great sauce to make on the weekend and enjoy throughout the week for lunch or dinner. Store the sauce in an air-tight in the fridge for about 4 days, or in the freezer for about 3-4 months. If you're purposely making the sauce to freeze for later, I recommend adding the cheese after defrosting and reheating. 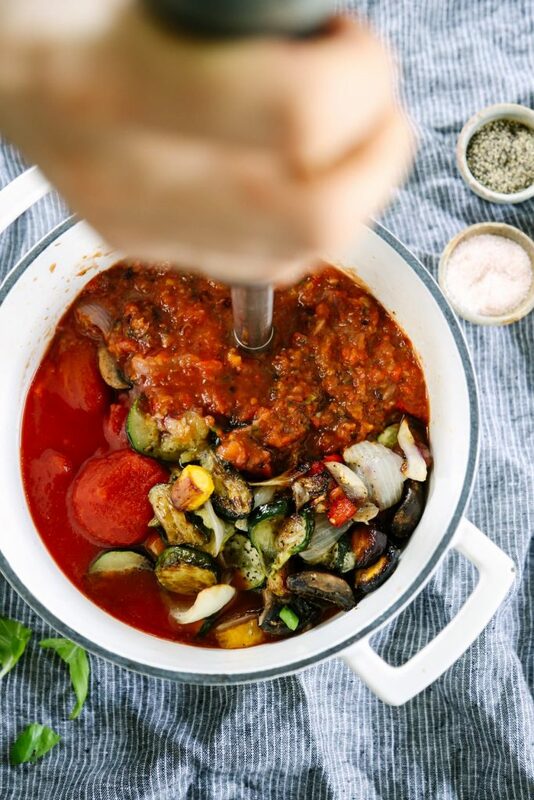 If you don’t have any veggie broth on hand, this sauce may be made with water or chicken broth. I’ve tried both, and the flavor was just as good. If you’d like to make this a dairy-free sauce, you’re welcome to skip the parmesan cheese. Using a bit of nutritional yeast may work in its place; however, I haven’t personally tried this substitution and I’m not sure how much nutritional yeast you’d need to replace the cheese. Any variety of whole tomatoes (in their juice) will work in this recipe. Yum! This is so good, I didn’t have broth so I used water and I browned a quarter pound of grass-fed ground beef and added while it simmered. I could eat it all day long and makes me so happy all the nourishment we are getting. Yay, Bethany! I’m so glad you’re enjoying the spaghetti sauce! I love that you added ground beef, too. I’ve been thinking about adding some sausage to my next batch. I love your spaghetti sauce! My friend is wondering if this recipe cqn be canned? Hey Beka, I’m not sure…sorry. Hi Kristin, do you think this would make a good pizza sauce? Hey Candace, I think it would work very well as a pizza sauce. Made this for dinner tonight and it was a huge hit. My two year old gobbled it up. I’ll use this recipe again for sure. Two thumbs up. Awesome, Ariel! I’m so happy to hear that! Hey Meredith, It will just about fill a 3qt soup pot, so about 10-11 cups. I made this sauce last night to freeze for pasta for my 18mo, but used some of the fresh sauce tonight for pizza for both my 3yo and 18mo. They loved it! I did, too. Very yummy! Thank you!